Vocalist Tim ‘Ripper’ Owens is a busy man. He has released no less than four albums with four separate bands in the last six months or so. His latest release is the self-titled debut album by new supergroup SPIRITS OF FIRE, featuring Steve DiGiorgio on bass, Mark Zonder on drums and Chris Caffery on guitar. I really like this line-up, and I am a fan of all four of these musicians. Tim ‘Ripper’ Owens has sung on too many albums to mention here, but everybody should know of the ones with JUDAS PRIEST, YNGWIE MALMSTEEN and ICED EARTH, and most recently, THE THREE TREMORS. Steve Di Giorgio is a legend on bass, having played on classic albums by DEATH, HEATHEN, TESTAMENT, ICED EARTH and of course the other band he is in with Tim, CHARRED WALLS OF THE DAMNED. Guitarist Chris Caffery is a star in his own right, having worked with the cherished Florida band SAVATAGE for decades before becoming the musical director in TRANS-SIBERIAN ORCHESTRA. Mark Zonder is the drummer of longtime metal band WARLORD. He also played on FATES WARNING’s albums from 1989-2004, and numerous other projects. As you can see, the metal pedigree is strong in SPIRITS OF FIRE. The first single released was “Light Speed Marching”, a solid lead-off track. This fantasy-themed song is nearly thrash, with plenty of riffs, double bass drums, and twists and turns. “Temple Of The Soul” stretches out a little more and gives Tim room to employ some of his different vocal ranges. Chris shines here as well, with riffs galore and an extended solo. “All Comes Together” is a rallying cry for unity. Mark delivers some precision drumwork on this track, and Chris contributes some symphonic moments. In fact, there are several symphonic moments that pop up throughout the album. The band’s theme song “Spirits Of Fire” has some groove to it, as does the acoustic-tinged “It’s Everywhere”, possibly my favorite track on the album. This song has a catchy chorus and Mark adds some cowbell in the chorus. You can view the video on KNAC.COM HERE. Mid-tempo (and longest at 7:20) track “A Game” reminds me a little of Tim’s solo work, while the punchy blast of “Stand And Fight” is possibly one of the best moments on the album. “Meet Your End” features a little more symphonic moments and Steve’s dominant fretless bass. “The Path” is an epic similar in style to JUDAS PRIEST, while album closer “Alone In The Darkness” is a legitimately heartfelt ballad. This is mainly a guitar-driven power metal album, with tons of riffs and aggressive guitar work from Caffery. It’s good to hear different vocal ranges from Owens. Producer ROY Z (HALFORD, BRUCE DICKINSON) adds his touch to these songs (as well as additional guitar) but it’s still a little rough around the edges and not overproduced. This is a pretty long album, (over an hour in length) and there are some filler tracks, but overall this album is a success. Stan Decker’s fiery cover art is a killer approach. Hopefully there will be a second album. 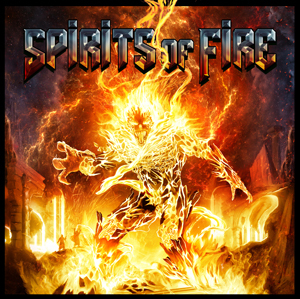 SPIRITS OF FIRE is available now from Frontiers Records.